As a small business in Dallas, TX, you’ve likely heard of “SEO” but do you know what it actually means? SEO stands for search engine optimization and refers to the refinement of digital content in order to improve or sustain rankings on Google search. 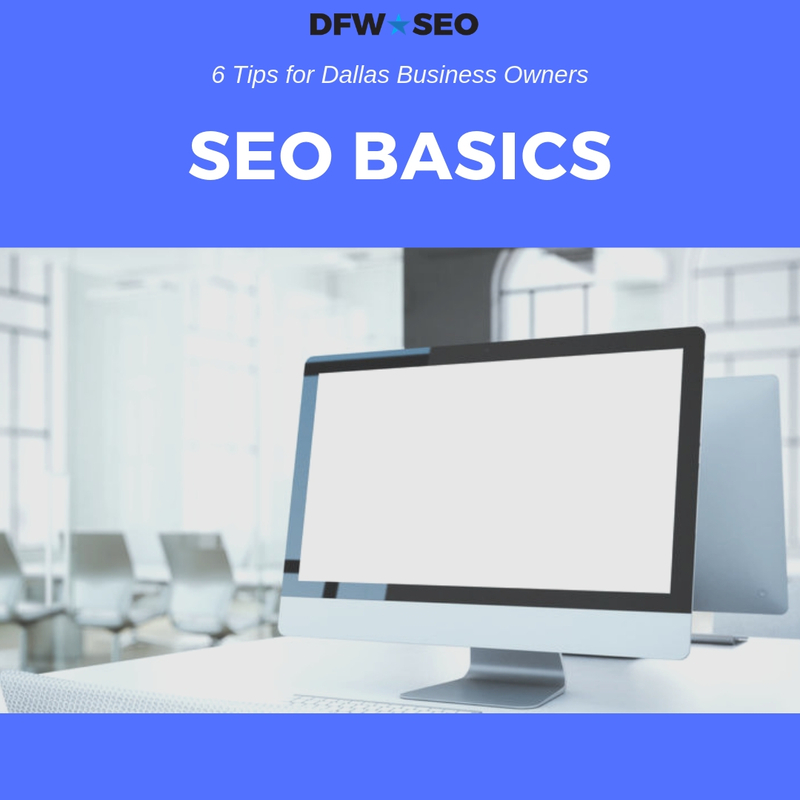 Going down the SEO rabbit hole can have your head spinning like a top … so the great folks at Dallas Fort Worth SEO have decided to focus on 6 tips that best embody the basics of search engine optimization. We hope you use these tips to bolster your online presence in Dallas and Fort Worth, and earn more leads. Reviews are very helpful in optimizing a GMB profile but generating them is not always easy. That’s why you should create business cards with links to your review profiles on Facebook and Google. You should also place these links in your email signature so that clients see them when corresponding with you our your employees. You should even go as far as asking loyal clients if they can provide feedback through Google, Facebook, and Yelp. Be careful not to incentivize reviews because Google well penalize you if you’re caught. Avoid asking for reviews from former clients who think poorly of you or your service. The aesthetics of a domain name are more important than you think. When a user looks up at the address bar and sees something that looks suspicious, they immediately exit out in many cases. This increases your site’s bounce rate which is strongly to believed to be a major Google ranking factor. When people leave your site quickly it signals to Google that they don’t trust it. That brings us to two of our other listed factors; reputation and trust. Dot coms exude both of these qualities to the users. As for convenience, dot coms are second nature to 99% of internet users. If they know your brand name, they are almost always going to think of it as a dot com. On the other hand, dot nets are often confused with dot coms, and can cost a business valuable traffic. You may feel that you don’t have time to write content for your website. There are marketing firms that provide content marketing services for Dallas businesses. In fact, Dallas Fort Worth is one of those firms. We believe that content quality is a fundamental component of SEO success. For content to be considered high quality, it must not only be grammatically correct, but also highly relevant to the website’s general subject. If your business belongs to specific industry, the content must accurately depict its intricacies. Readers can tell the difference between good and bad content fairly easily. Google values the highest quality content. Pre-made templates are cheaper right off the bat, but once you get 6 months to a year later, you’ve ended up losing far more money than you would’ve spent. Trying to nickel & dime your way to the #1 Google spot is not realistic. But it makes sense why some businesses would find the cheapest option appealing. They feel like they’re cutting costs. But in 2019, it seems that many owners are smartening up and understanding that proper marketing is actually critical to their bottom line, and digital marketing is at the forefront of all of that. Some of the tools above might look familiar, others might not. LSIGraph is a nontraditional keyword research tool that provides terms and phrases that are semantically related to primary keywords. We touched on the need for synonyms in high ranking page content, and LSIGraph is a tool to help you integrate those kinds of words. MOZ & SEMRush are more traditional tools that provide the volume and opportunity for keywords, along with suggestions. UberSuggest is a free tool that emulates SEMRush. It is not quite as accurate, but good for Dallas business owners who don’t have money to spend on a research tool. The best way to earn links in 2019 is to produce excellent long-form content. These content pieces have a great chance to go viral, especially when pushed through social media channels like Facebook, Twitter, and even LinkedIn. One way to increase the virality of content is to utilize video and audio integration. Try embedding videos from YouTube onto your blog posts for demonstration purposes. As for business directories, look to BBB, Yelp, and other highly renowned platforms to build a profile. In most cases, you can claim your free profile on directories like these. While they don’t have the same “link juice” as a guest post for example, they still transfer authority. Some links automatically have nofollow tags, which means they count less towards domain authority.